Hampi (Vijayanagar) Bellary District: Garuda Temple and Maha Mandapa, Vitthala Temple Complex. This photograph shows the Garuda shrine and Maha mandapa, Vitthala temple complex, Hampi (Vijayanagara). 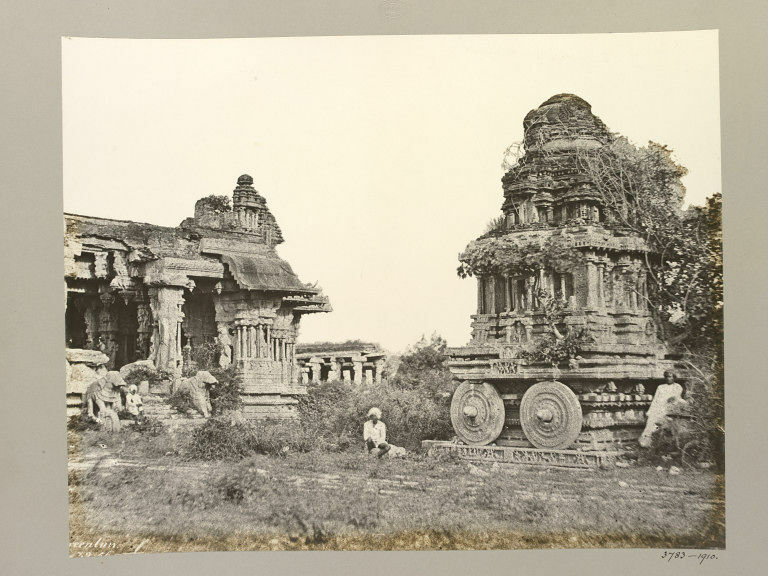 This photograph shows an oblique view of an ornately decorated and domed stone shrine resembling a chariot with large stone wheels, and to the left is seen a section of a temple with elaborate detail including a pair of stone elephant balustrades and clusters of columns. The structure appears to have receding sections of stone awning. Between these two structures can be seen a section of a plainer colonnaded structure. The buildings are overgrown with vegetation. Three assistants, posed presumably to indicate scale, show some camera blur suggesting the lengthy exposure time used for this photograph. Inscription bottom left. The negative is inscribed 'Greenlaw/ 32-56' and this partially appears in the bottom left hand corner of the photograph.The complete number is confirmed on the negative for this print. The main shrine, as pictured in this photograph, was built in two stages. First was the enclosed ardha mandapa with side porches and a covered circulambulatory passageway, or pradakshina prakara, with delicately modelled basement mouldings and wall pilasters. This led to a sanctuary, or garbha-griha, with a small brick tower where the idol which would have been kept. It is since lost. Probably contemporary to the building in 1554 of the maha mandapa and the two ornate mandapas that stand nearby is the chariot-like stone shrine,as seen in this photograph, that houses an image of Garuda and stands as a centre-piece in front of the maha mandapa. This is a shrine rather than a moveable chariot and takes the place of a Garuda shrine which is normally seen in Vaishnava temples. All the details found in a wooden chariot are simulated in this stone car and even its stone wheels revolve. Two elephants guard the entrance to the shrine which is approached by a very wooden-like stone ladder. Horses were originally intended instead of elephants and their tails can still be made out. Inscriptions mention the idea of ‘lasting forever’. This probably explains the use of stone instead of, but simulating, wood construction,, even mimicking the protective metal sheeting which typically covered the wood. This shrine was originally crowned with a brick tower, similar to that over the main shrine, as seen in Greenlaw’s photographs, however this was dismantled in the late nineteenth century. 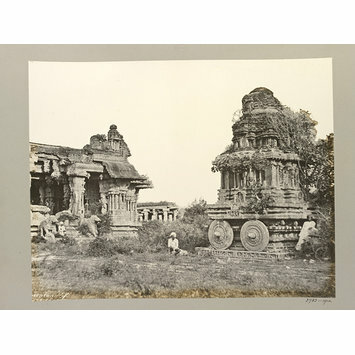 The photograph is siginificant as a visual record of the Garuda shrine and Maha mandapa before any restoration work was carried out. Here, the shrine has a brick and mortar tower which has since been dismantled and the Maha mandapa has since been supported by several masonry pillars.